Enter a description for the Restore Point. Typed in 'create restore point' in the start orb. A box popped up called system properties which is under the system protection tab. The create button was at the bottom of this pop up box. Although my computer is not running at its best, it is faster now, Thanks to you! I never download anything big nor do I have any fancy programs, yet random slowness persists. OK, thanks for the complement. It's possible that slowness can come from the system running hot. If yours is running hot, you might consider cleaning internal dust and debris from the cooling fan(s) and heat sinks. This of course isn't malware-related, but in my experience, I have found that the thermal paste that bridges the CPU surface to it's heat sink can "dry out" over time, especially with heavy loads (heat), and lose some of it's thermal conductivity. I've had good success with cleaning/replacing that thermal paste, but it's not a project for those who aren't comfortable with taking their computer apart. If you think this could benefit you, and you'd like help from our fine Techs here (or just some guidance on how to do it), head over to our Hardware, Components and Peripherals forum and open a new topic there. Congratulations, your log is clean! The first thing we need to do is to remove all the tools that we have used. This is so that should you ever be re-infected, you will download updated versions. It will also remove the quarantined Malware from your computer. The program will run for a few moments and then notepad will open with a log. Please paste the log in your next reply, and delete any remaining tools we downloaded, registry files, and logs that you have left over on your Desktop, or in your Downloads folder (if that's where you saved them). If you need any of these tools for later, you will get fresh copies, and this will prevent you from accidentally running a tool on your system which could damage it. Now let's take a few preventative measures to reduce the risk of further infections. Another essential is to keep your computer updated with the latest operating system patches and security fixes. Windows Updates are constantly being revised to combat the newest hacks and threats, Microsoft releases security updates that help keep your computer from becoming vulnerable. It is best if you have these set to download automatically. Most malware is exploiting Internet Explorer's vulnerabilities, with Firefox you will likely be more secure. NoScript - for blocking ads and other potential website attacks. AdBlock Plus - block annoying ads that cost you expensive bandwith, with the added benefit of faster page loading. McAfee SiteAdvisor - this tells you whether the sites you are about to visit are safe or not. A must if you do a lot of Googling. If you use any Adobe software make sure to keep them updated. Best of all, they are FREE. Note: Make sure to uncheck the check box labelled "Yes, install McAfee Security Scan Plus - optional", or any other optional "features". On to personal Anti Virus programs. One AV is a must have, but never more than one, as this can and will cause conflicts, system slow-downs, and false readings. If you wish to keep using your current program, Microsoft Security Essentials, always make sure it is up to date and enabled. Avast! Home Edition - a very good free AntiVirus. Finally, it is a good idea to clear out all your temp files every now and again. This will help keep your computer running optimally. It can detect registry errors, missing shortcuts, invalid files, etc. It also can assist in getting rid of files that may contain malicious code that could re-infect your computer. 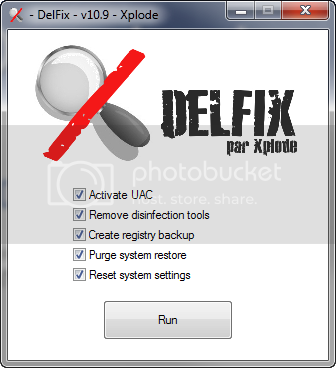 TFC by OldTimer is a free temporary file cleaner. Go here for information about CryptoLocker Ransomware. Learning about what is out there may help you prevent infection. The best protection against this infection is to backup your files often. If you're using an external drive, keep it unplugged from the computer when you're not backing up files or using it. This will prevent the infection from getting to your backed up files if you ever have the frustrating experience of contracting it. It is suggested to download and install CryptoPrevent, which is free for home use. It will help prevent CryptoLocker and other similar infections. To find out more information about how you got infected in the first place and some great guidelines to follow to prevent future infections you can read this excellent article, originally written by Tony Klein, and updated by SpySentinel. I will keep this log open for the next couple of days, so if you have any further problems, you can post another reply here. OK, happy computing, and stay safe! Please reply again to this thread to acknowledge you have read my last post. If you have no further questions, this thread will be closed to prevent others from posting here. long running scripts always freeze up the game- I assume it's because of the websites ads and chat feature. By switching to Firefox, do you think it will alleviate this problem? If I go with Firefox, should I uninstall Internet Explorer? Why is Internet Explorer more susceptible to malware than Firefox? Good question. That part of my closing speech was written probably a couple of years ago, when ActiveX controls were more of a threat than they are these days. It also depends on what version of IE is being used, as not everyone wants or bothers to update. For some time, IE came as an irremovable part of the Operating System (Windows XP) and therefore was a very appealing target for malware writers. Interesting that you mentioned Firefox has the No Script/Ad Block Plus functions. I play chess on the internet and long running scripts always freeze up the game- I assume it's because of the websites ads and chat feature. By switching to Firefox, do you think it will alleviate this problem? I would give it a try to see. Website traffic levels may have an impact on user experience too. I use both Firefox and Chrome, and use the AdBlock and NoScript extensions too. NoScript can be a little confusing for beginner-level users, since at first you will have to teach it some normally safe things. There is a setting too to allow sites opened from bookmarks by default that may make it a bit easier.. The protection it gives is unparalleled in my humble opinion. There's no need to. You can try Chrome, Safari, and others you like, and they can peacefully coexist on your system (they should). The main thing is probably which web browser you tell Windows to make the "default" one. Let me know if you have any further questions or issues.